By 2013, the Southern Hirak became a movement that no one can ignore, even though the government was trying to do just that. Lives were lost before President Hadi went to visit the South (where he is originally from); his first visit since assuming the presidency. As of February 26, 2013, the majority of Hirak leaders are refusing to participate in the national dialogue which is only a few weeks away. The expanding movement in the South first used the title, Al Hirak Al Janoubi Al Silmi (Peaceful Southern Movement), in 2007. Then it was a simple movement with a distinct leadership. Presently, the Southern Hirak has too many leaders to keep track of; however, two main figures stand out; Ali Al-Beidh and Hassan Ba'oum. Ali Salim Al-Beidh is the main leader of Hirak residing outside of Yemen, and Hassan Ba'oum, Mohammed Ali Ahmed, and Nasser Al-Noubah are the main figures inside of Yemen. The problem is that these leaders do not see eye to eye. They all consider themselves the founders of the movement but the truth is some were there before others. 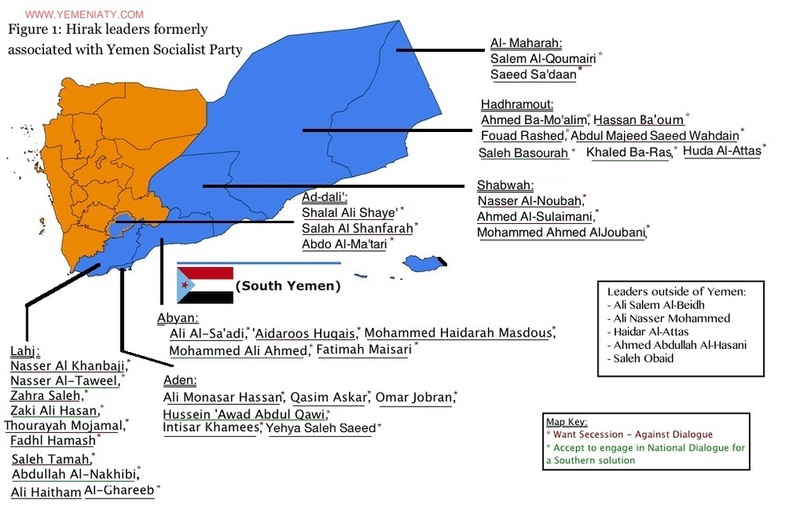 Also, the leaders inside of Yemen seem a lot more legitimate since the majority of the Hirak leaders outside of Yemen were highly influential in the PDRY and in ROY (Republic of Yemen) until the Civil War of 1994. As though their interest in Hirak is aimed at restoring their glory. Much like the Yemeni Revolution of 2011, the Southern Hirak movement is mobilizing the youth. Ironically, none of the principal leaders are actually from that age group. In line with the obvious Southern discord, Southern Hirak is not the only group claiming to defend the "Southern Cause". Over the past few years, many new factions were created or evolved from previous movements. The problem is that many people can use the term Southern Hirak. While some maintain their peaceful standpoint, there are many radicals who are waiting for the right time to start an armed conflict. To understand the diversity of Hirak, one must understand that its members adhere to a wide range convections. At one end are the radicals (which includes the militants) and the other end are the moderates. The radicals are exclusivists; meaning that they reject any person with a Northern last name even if they lived in the South for decades, fought alongside the Southerners or called the South their home. As a matter of fact, some of the Northerners in the South are thought to have been spies and part of Sana'a's regime in the South. They would not accept to engage in dialogue at any cost because secession is the only viable option. In this category, the individuals are dogmatists who view the South under the full occupation of an authoritarian Northern rule. They would like to call the South of Yemen Al Janoub Al-'Arabi (The Arabian South), completely rejecting a Yemeni identity. Within this radical branch of Hirak are several operating militias (it is also worth noting that the South is witnessing an increase in militias not affiliated with Hirak or the Southern Movement). Keeping in mind that the more radical the group, the bigger the conspiracy theory and the greater the need for armed resistance. At the other end of this spectrum are the moderates, who are willing to engage in dialogue. Many of them realized that the South witnessed a dramatic transformation since unity was established. Their life-styles changed, literally, over-night and only got worse after 1994. With Saleh gone, these moderates understand that some Northerners are living in the same appalling conditions as the Southerners, but they fear that South will continue to be ignored. The majority of the Southerners identify somewhere between these two divergent views. The Southern Hirak is becoming their cause and the more the world dismisses their grievances and the Yemeni government delays reconciliation, the worse it becomes.